This 1850 sf multi-use structure encompasses an artist’s studio, exercise room, small offices and media room. The program called for simplicity of design, cost effectiveness and minimal site impact. A long shed form slides in among tall firs and cedars and allows views to the water from the upper floor. 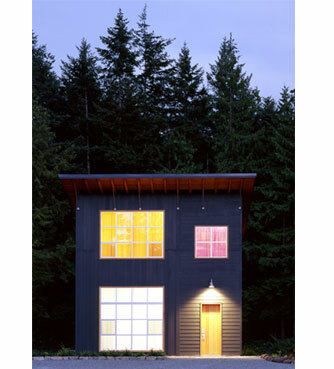 Use of durable and common materials, including a mix of painted cedar and cement board siding and metal windows, emphasize industrial qualities and ease of maintenance. Large windows bring in natural light and views as well as create the effect of a large illuminated lantern at night. Built-in douglas fir cabinets and shelving provide warm accents and a contrast to the dark stained, heated concrete floor.